Located in southeastern Tucson, Rita Ranch is a beautiful master-planned community that’s near numerous amenities and attractions. It offers easy access to I-10, the airport, Davis Monthan Air Force Base and UA Tech Park. Plus, great shopping and recreation are also found near Rita Ranch homes for sale. With 27 subdivisions and a variety of home styles, there’s something for everyone in this wonderful community! Residents of Rita Ranch real estate are met with excellent options in parks & recreation. The lovely Purple Ridge Park is located here. This large regional park contains a swimming pool, lighted baseball fields, playgrounds, a walking trail, a skateboard area, picnic tables and grills, and a swimming pool. There are also several smaller neighborhood parks to enjoy. For shopping and dining near Rita Ranch homes for sale, the community contains two main shopping centers offering a variety of businesses including grocery stores, restaurants, banks, dental and medical offices, and veterinary services. Plus, Rita Ranch is a short drive from the many shopping, dining and entertainment options that Tucson offers, including the Park Place mall and the Tucson Convention Center. Rita Ranch is an especially great choice for families, particularly those with school age children. It is located in the highly regarded Vail Unified School District, with three elementary schools and one middle school located right within the community. Real estate in Rita Ranch consists of a wide range of property choices, from southwestern with a flat roof to more contemporary homes.. These are mostly newer properties with the average age being less than 15 years old. Current housing prices range from $130,000 to around $340,000. If you would like to learn more about available homes for sale in Rita Ranch, please contact the Tucson area experts at Professional Choice Real Estate for a stress-free and well-informed home buying experience! This home boasts 3 bedrooms, 2 1/2 baths, an extra teen room, spacious kitchen and great room. Also included are 10ft ceilings throughout with coffered ceilings in the foyer, greatroom, master and study. The gourmet kitchen has a double oven and gorgeous granite countertops. This home is a must see! This is a 4 bedroom, 3 1/2 bath like new home, very well maintained, with plenty of extras. One junior suite. Extra large pantry and kitchen plumbed for both gas and electric. Large master bathroom walk-in shower. Plenty of storage and fantastic views. Located on cul-de-sac in a great neighborhood. Next to small park. Must see. This meticulously maintained 5 bedroom, 3 bath home is located in the Vail School District, close to shopping and so much more! This amazing home has a loft upstairs and downstairs bedroom that can double as an office. The kitchen has gorgeous granite counters, an island, and S.S appliances. Great room has plenty of room for entertaining PLUS a separate living area. The master bedroom is large and has a walk-in closet, attached master bath w/dual sinks and a shower with separate tub. Upstairs laundry room is conveniently located next to the bedrooms. Epoxy flooring in the double car garage. This home is a must see! Gorgeous Richmond American Home in the highly sought after Vail School District. This home is in Mountain Vail Estates and walking distance to Esmond Station K-8. So much storage and space in this 2,995 s/f, 4 bedroom, 2.5 bath home. Open great room design with the den and half bath downstairs. Huge island for cooking and gathering, extra large walk in pantry, new black stainless steel Samsung Appliances (fridge has wi-fi capabilities), gas range and plenty of additional counter space with upgraded cabinetry. Upstairs you will find a generous loft for bonus space, 3 bedrooms, 2nd bath and master suite. Master suite is extremely spacious with a custom barn door for bathroom privacy. Separate dual vanities, soaking tub, separate shower, enclosed water closet and dual walk in closets. Welcome to this amazing property. This awesome 5 bedroom beauty, exudes pride of ownership from the second you step in. This gorgeous home qualifies for the Pathway to Purchase, so don't miss out up to $20,000 towards your down payment. Located in the highly desirable and family friendly Rita Ranch Crossing. Its new owner/s are greeted with open arms. This home affords the desirable floor plan upgrade, spacious chefs kitchen, durable tile and carpet throughout. This home has a great back yard space for those sunny days, and entertaining pool side. Numerous neighborhood amenities include multiple family friendly parks and scenic natural walking paths. A gem like this is sure to catch a lot of attention so don't let an opportunity like this slip by. 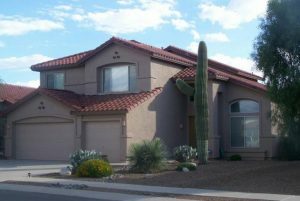 Range priced $318,000-$349,000 Fabulous 5 bedroom and 3 bathroom home in sought after Desert Willow Estates on an exterior lot with incredible views of the Rincons with a pool and 3 car garage. This terrific floor plan has a bedroom and bath downstairs plus an open kitchen off the large family room. This stunning two-story home offers soaring 9-ft. first-floor ceilings and a popular open concept floor plan. The gourmet kitchen features granite countertops and 42-in. Timberlake(r) upper cabinets. Our designers have selected tile flooring throughout the first floor, with lush carpeting on the second floor. Enjoy the warm desert nights on the extended covered back patio with no rear neighbors. This ENERGY STAR(r) certified home is located within walking distance of award-winning Vail schools. This home is move-in ready. Sales Price includes a discounted sales price that is subject to buyers using KB Home preferred lender KBHS.